The Arkansas Traveller quilt block contains only the easiest of quilt patches -- squares, rectangles and half square triangles. This block is constructed as a four patch with identical patches in each of the four quadrants. Rotations of those components is what adds the interest to the block. In the two sample quilts illustrated I have used a straight set of the blocks, separated by sashing and also a setting of the blocks on point with additional blank areas to display your quilting skills. 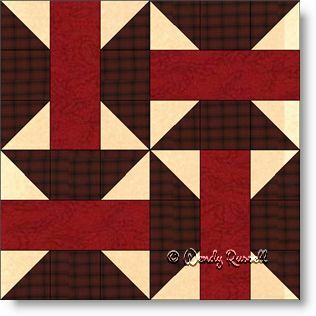 All sorts of interesting arrangements can be made using this quilt block, by placement and rotation of the blocks.